A FRIEND OF MINE TALKED ME INTO USING THIS NEW HOT CRYSTAL DRANO IN MY TOILET. IT LEFT BROWN STAINS DOWN WHERE THE WATER RUNS OUT AT. EVERY TIME A APPROACHED THE TOILET, I GOT MADE BECAUSE MY NEW TOILET NOW HAD THESE EMBARRASSING STAINS NOW. YOU KNOW WHAT ANYONE WOULD HAVE THOUGH CAUSED IT. I USED THE PUMICE STONE AND COMPLETELY REMOVE THE HIGHLY EMBARRASSING STAIN FOR GOOD. YOU CANT IMAGINE HOW RELIEVED I AM TO BE RID OF THAT STAIN. I have seen other products similar and they are so much more expensive! I finally found something to remove the stains in the toilet. When my mom told me she ordered this to help remove the heavy mineral deposits which had accumulated in our toilet I wasn't impressed. However, as I began using the pumice stone I was amazed that it was actually working. It does take some elbow grease if the build up is heavy. I found the stick awkward so I removed it and scrubbed away. Honestly, we really thought we would have buy a new toilet but this handy pumice stone has saved us from that expense. The lime build up in the toilet bowl is history! It took awhile but the bowl is clean. I saw a review that said this gadget broke the first time it was used, so I was careful, holding the stick lightly and rubbing the stains lightly. Everything worked fine. I then wondered what to do with it, now that it was wet and I didn't want to put it away like that, so I took an empty toilet paper tube and it fit perfectly and also had a place to dry. The girl I had clean my house hated toilets. So there was buildup along the rim. This is a miracle tool. I have bought this product several times. It is the only product that I have found that chips away at hard water stains and calcium build up in toilet bowls. It works without hardly any effort and leaves no marks. The only problem with this product is that it usually breaks off from the handle, but it is still serviceable off the handle. Really love my toilet cleaner. Wish i have order more. It really clean the toilet really good. I NOTICED THIS RECEIVED BOTH GOOD AND BAD REVIEWS, MANY SAID IT DOES NOT DO JOB. IT DOES DO JOB BUT NEEDS ELBOW GREASE! TOOK 5 MINUTES WITH A LITTLE ELBOW GREASE TO REMOVE LIME BUILD UP ONE THE WATER RIM. When we purchased our home it was a few years old and we had a difficult time keeping the mineral deposit ring out of the toilets so we always had to use cleanser and a coarse sponge and a lot of elbow grease to remove the ring. This little tool works like magic with the minimum of effort. The good news is the ring has not returned and the porcelain was not harmed. 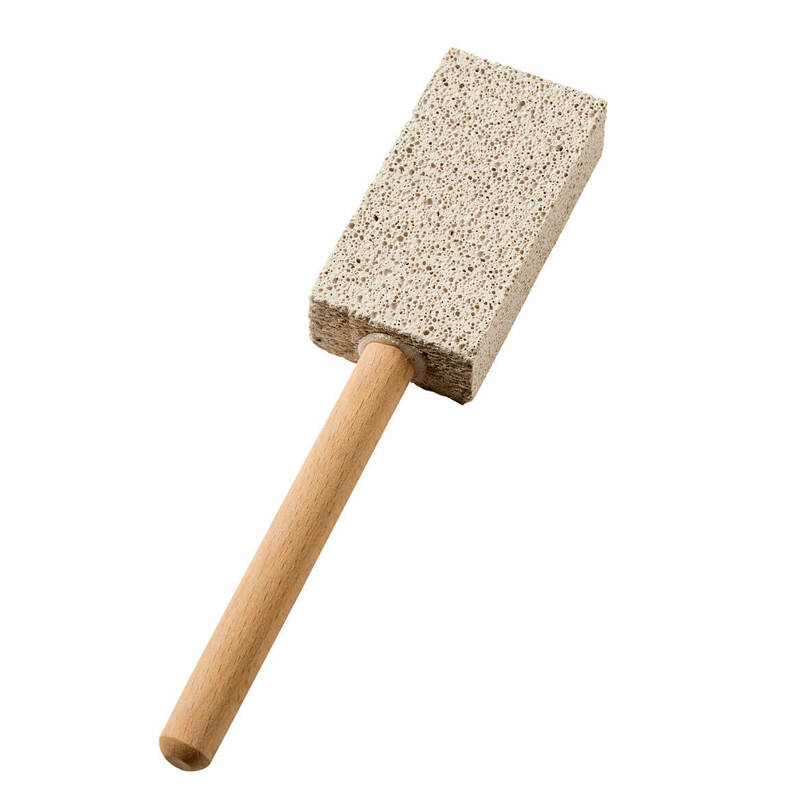 We have hard water and have always used a pumice stone to clean our toilets. This one is great in that it has a handle. It makes it much easier to use. 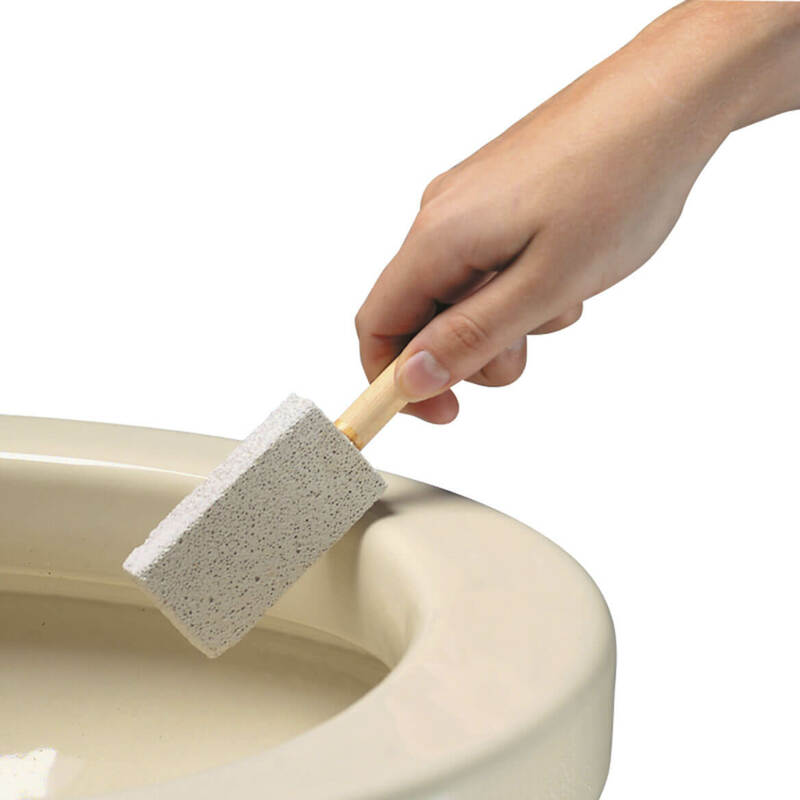 I use the potty pumice to get rid of those horrid water stains that build up right at the water line. Works wonders. There were hard water stains in our toilets when we bought our home and I have not been able to get them off using cleaning products. This was my last resort before buying new toilets. With just a little elbow grease the stains came right off! This works great in taking off built up lime on toliet bowls. Amazing how well this will clean a toilet! Removed hard water stain that had been in toilet for at least 10 years. Nothing else I tried worked. It's great! It's the only thing I can find that will clean toilet stains, with no porcelain damage & makes it snow white BUT it takes alot of muscle work and time scrubbing - but there's nothing easier that I've found, so at least it gets it clean, no matter how long it takes. Better than any cleanser for the toilet. Used it for years. Wonderful! With little effort, got all stains out that I could not get out with cleaners. This product removed the stains from my two toilets that had been there for 10 years. I had tried everything I could think of and nothing worked until I tried this. I am so happy and pleased with the results. Easy to use and you can't beat the price. No smelly chemicals or dangerous fumes. Works GREAT in pools, also. Work great at removing calcium deposits from the walls of the swimming pool. The handles do break off easily, but then we just use the pumice stone until it is totally gone. I also use one for the deposits around the toilets as we have a lot of calcium in our water here in AZ. I used it on a toilet in a travel trailer with a build up about 3+ years on it. It took some work but everything came off. My S.O. was very impressed as he didn't feel it would come clean. I really needed it to be clean as we are renting out the unit this year. I was really sceptical about whether it woul work or not. The pumice stone really takes off stains in the toilet bowl that had been there a long time. Very easy to use and works! I will buy again and again !!! I had a hard time getting the stain's out of my toilet until I bought this and it worked very well !!! I have tried many products to get stains out of toilet from well water, and this pumice really, really works. My bowls are shiny white again and it has been 2 weeks since I used the pumice and the bowls are still stain-free. I am so happy I took the chance and got this item. I was a bit worried after reading some reviews. Most said handle broke right away, not sure how they were working with it but mine is just fine. My handle is made out of wood and I am not sure if others were made out of plastic. It took the lime ring around the water level in my toilets in a matter of only a few minutes. I had worked on that problem for years with lots of different cleaners. It was easier to get the lime ring gone if I worked on it just after flushing so there was less water in the toilet bowl. Only regret I wish I had ordered this years ago. Good company to buy from, every thing I get is good. I had tried a number of things that didn't work. This was the first thing that worked, and it was quick and easy. I love it! I used it on my toilets. We get terrible stains and rings in our toilets. This worked on stains we have had for 5 months and could not remove until now. It actually does not scratch the toilet. I highly recommend the eraser. My toilets have never looked better. Even better than new. They sparkle now! Got this for our downstairs toilet. Had one before but it broke so I got another one. Works really good. Great tool for an unpleasant job! We have well water so our toilets get hard water rings very quickly that are difficult to remove. I bought one for every bathroom. I actually used to use a Phillips screw driver and a hammer! These stones don't scratch and work quickly with little effort! Have used it for many years! I had a ring in both of my bathrooms toilets form just water sitting in them and i tried several ways to get the RING out it was at the top of the stand water and every way i tried failed so then i saw this product and i said to myself...I will try it and if this does not do it i will just replace both toilets with new ones as i was tired of seeing the ring... so i used this product and after a few minutes of working with this product the RINGS were GONE !! Now the toilets look again like they are NEW!! It is an EXCELLENT PRODUCT !!! I wish I'd found this product years ago! 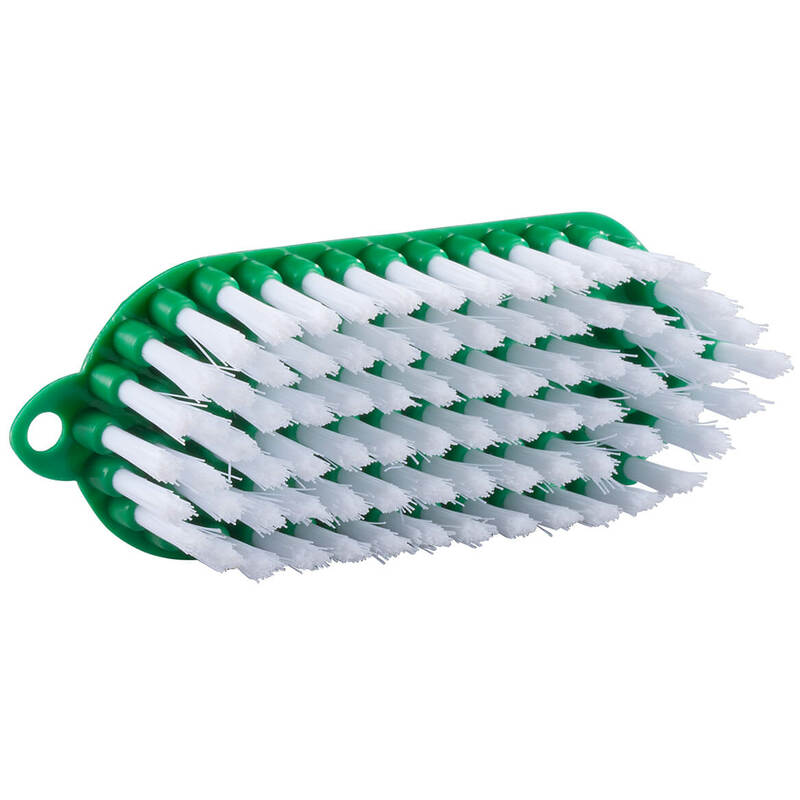 I have been using these for years - safe for the porcelain in the toilet and cleans up mineral deposits without much effort. Always a great product to have in the house! for 9 years i've been trying everything to get the ring out the the toilet bowl. bought this eraser and it actually worked! i was impressed and ordered 2 more. I have been using this product for 25 yrs. I was in the house cleaning business for 16 yrs and this product contributed to my success. It is inexpensive, easy to use and nothing works like it. It gets mineral stains off the inside of the toilet without scratching. There is no other product that works this good, I've tried everything else! I tried everything I could think of to get the stains out my toilet. Then a friend recommended this pumice stick. It did exactly what I needed done with very little effort on my part. I had one from quite a long time ago and still use it but it is getting to the end of the pumice. 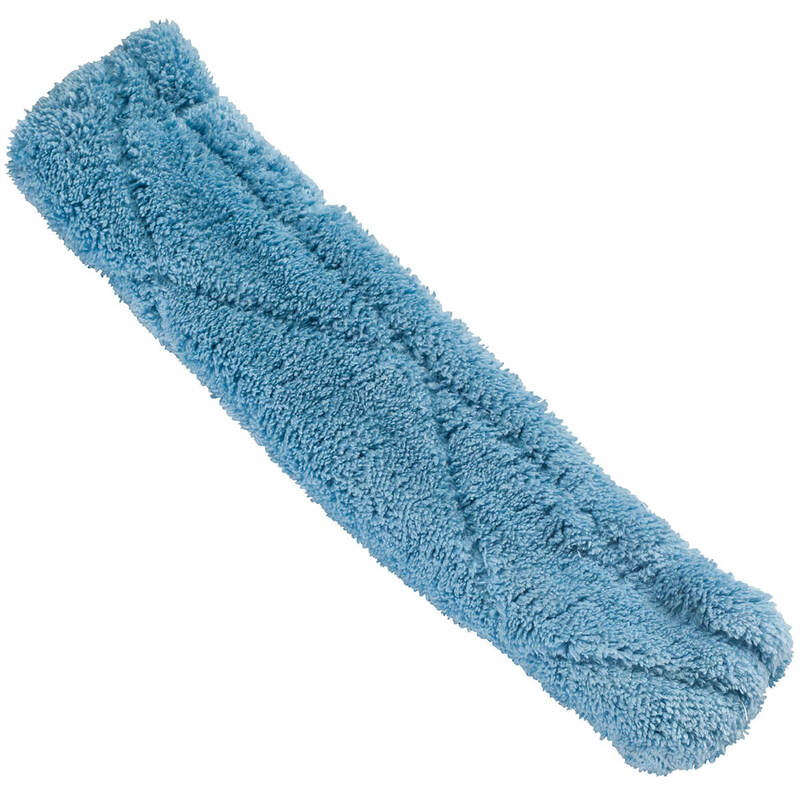 The size is small enough to get in under the rim of the toilet to remove hard water deposits. I've used these for years and they've always worked well for me. I bought one previously, and it was fantastic! I had never been able to get the stains out before I bought this product. I saw the reviews on this and want to give it a try. Will post back if it really works. Hope it will cut down on the frequency of toilet cleaners and just do the job quickly when in a hurry. As Chlorine is detrimental to people's health and especially for thyroid health, I need something to keep my toilet bowl white. I have stains in my toilet bowl that I can't get out. And I like a clean toilet. Have used similar items in the past, but none had a handle. Most people are not even aware that this works great for toilets. My toilet brush scraped my bowl and this worked great to remove the metal scrape marks. i have hard water in my town. I thought it might help to remove a ring from one of my toilet that could not be removed by anything else and noticing that some of the reviewers have the same problem and it worked so I decided to give it a try. Helps to get the hard water stains off of the toilet without damaging the porcelain. Had these before and they really work! I have a stain problem and I hope this will solve my problem. I have been looking for this everywhwere!! I need them for my janitorial work. They work so great!!! My toilet has lots of stains. I thought this might. help. Did an OK job with my well-water ring but did not remove completely. Was expecting better reading the reviews. Hard water where I live causes a great many stains! I just wanted to try it for cleaning the toilet. I have old stains in my toilet, I hope this will take it out.